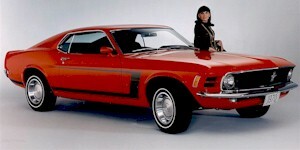 The 1970 special model Mustang Grabber was a special package to promote the Grabber paint colors. They were all fastbacks painted in either Grabber Green, Grabber Blue, Grabber Orange, Calypso Coral, or Bright Yellow. The were optioned with the "Grabber Special Value Package". The Grabber Package included; the special "C" stripe which is similar to the 1969 Boss side stripe but without the lettering, the F-code 302ci 2bbl engine, body colored side mirrors, blacked out rear taillight panel, and 14-inch wheels with dog dish plain hub caps. This is 1970 Mustang in bright Grabber Blue with the Mustang Grabber option. It's also known as the Grabber Edition. The Mustang Grabbers were Sportsroofs with these special 'C' Side Stripes (similar to the 1969 Boss 302 but with out the lettering), the 302 2V (F-code) engine, colored side mirrors, and a blacked out taillight panel. Blue was a popular color in 1970. There were no less than five different blue paints available on the Mustang in 1970. Click here to check out samples and links to other 1970 Mustangs painted those colors with the help of our Data Explorer. Check this one out! It's a Grabber Orange 1970 Mustang fastback with the Grabber Package. Paul, the owner, shares, "I ordered it in December of 69 and picked it up May 1st of 70 for my last month of senior high. I saved my paper route money for 8 years and payed $2700 cash. It listed for $3200. That 1 picture is the only picture I have of when it was new. I have drag raced it, ran it at Bonneville twice and road raced it which is it's current form. It's a streetable road race car so it's not full road race." This Mustang was optioned with the "Grabber Special Value Package" which included; the special "C" stripe which is similar to the 1969 Boss side stripe but without the lettering, the F-code 302ci 2bbl engine, body colored side mirrors, blacked out rear taillight panel, and 14-inch wheels with dog dish plain hub caps. Calypso Coral 1970 Mustang Grabber Special Edition fastback. It has the 302 2v V8 engine, 4-speed manual transmission, and the Grabber Special Value Package. This package included the black "C" stripes on the sides, dual sport body-colored mirrors, and black rear taillight panel and spoiler. The Grabber Special Value Package also included paints in either Grabber Green, Grabber Blue, Grabber Orange, or Bright Yellow. Check out this Bright Yellow 1970 Mustang Grabber Special fastback! It has the unique black reflective Grabber "C" stripe on its sides. Other parts of the Grabber Special Package include an F-code 302ci 2bbl engine, body colored side mirrors, blacked out rear taillight panel, and 14-inch wheels with dog dish plain hub caps. The wheels have been swapped with Magnum 500 style wheels.